Most travellers start their Peruvian trip in Miraflores, Lima. This charming neighborhood has it all: nice hotels, restaurants, bars, entertainment, shopping, museums and culture, parks and gardens, plus a waterfront with a surfing beach and a pier. There’s even an archaeological attraction, an ancient pyramid and adobe community. And Miraflores is safe and clean. The rest of Peru might be the playground of feral dogs, but not a single stray gets away with roaming Miraflores. On my first night a rough looking dog tore through the garbage by my hotel. Within moments the police had arrived, netted the offender and dragged him out of Miraflores. Officially Miraflores is a district of Lima, but it has its own mayor and municipal government. It has enjoyed this designation since 1857. After a decisive battle in the War of the Pacific it became known as the Miraflores, The Heroic City (Ciudad Heroica). With about 100,000 of Lima’s most educated, cultured middle-class and affluent people this is Lima’s the international hub. It is where you’ll find a global spectrum fine dining, from Argentinean steakhouses and Mexican restaurants to Irish pubs. International hotels also built in Miraflores. The Hilton, the Ritz Carlton, the Marriot, and other first class hotels are here. There are plenty of good hotels for smaller budgets, as well as youth hostels. International and Peruvian businesses are headquartered in Miraflores, like LAN the national airline, and the offices of most foreign banks. Despite the presence of big business the atmosphere remains slightly bohemian, reminiscent of the Southern California seaside. It’s normal to see surfers hauling their boards down the sidewalk towards Miraflores Beach. Street vendors offer a range of edibles from bakeries, ice creameries, florists and bottlers. Larcomar is Peru’s most original and beautiful shopping mall. From across the street at the Marriot Hotel you cannot see the mall. 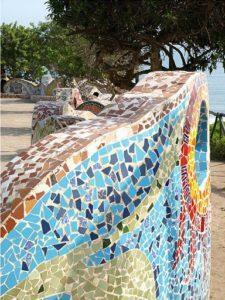 It is built into the face of an ocean front cliff and steps down in six levels. There is a cinema, museum, and international stores like Radio Shack, Timberlands, and eateries like Starbucks and Hooters. All the restaurants feature decks facing out onto magnificent views of the Pacific Ocean. The weekend atmosphere never ends around Parque Kennedy (named for the late American President), but on Sundays street musicians and the craft and produce market draw added crowds of relaxing Limans. Nearby at Calle de las Pizzas the crowd is youthful; both Peruvians and tourists meet and mingle in the many hip pubs and cafes. You’ll also find some of Peru’s most interesting art galleries, independent theaters, and movie cinemas showing first run movies. Other cultural attractions in Miraflores include the amazing Huanca Pucllana, the remains of the Lima culture’s urban center, featuring an abode pyramid and ceremonial center dating from 200 A.D. The Museo de Historia Natural with a huge collection of taxidermy critters; the Museo Amano with a collection of ancient ceramics; and the gold and silver treasures of Museo Enrico Poli. At El Parque del Amor, Victor Delfin’s enormous statue entitled El Beso (The Kiss) is almost as iconic of Peru as Macchu Pichu. This sculpture of two lovers is set on the cliff-top garden above the Pacific Ocean. The immaculate gardens and stunning view identifies Miraflores as the heart of Lima. Like most visitors to Peru I began and ended my trip in Miraflores. After touring the Central Highlands, Cuszco, the Sacred Valley, and the North Coast, returning to Miraflores was an assuring comfort. It always feels like home, and I will return. 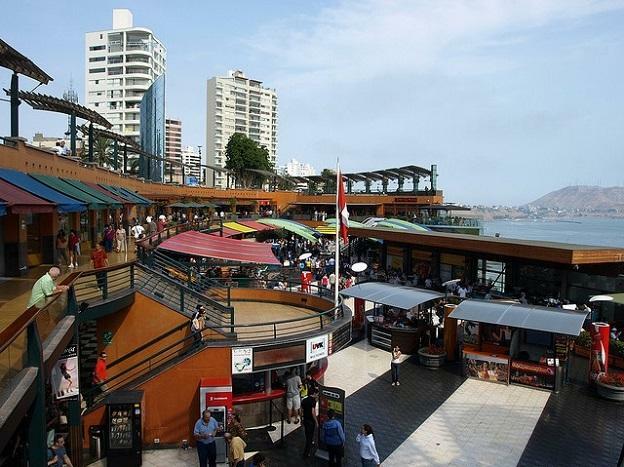 Virtually all tours begin and end in Lima‘s Miraflores district. To experience something a little different during your stay, contact a Peru luxury travel specialist and ask for a tailor made Peru tour. By Andrew Kolasinski a guest travel blogger who has recently come back from a six months tour around Latin America.